I love finding obituaries. Even though they often aren't enough to be proof of facts (there's just too much room for error), they help illuminate the person's life beyond just the facts. The interesting thing about this is she died of a "short illness". I have yet to get her death certificate, but I suspect that she died as a victim of the "Spanish" Influenza Epidemic.The newspapers from October of 1918 are heartbreaking. Every day the number of death announcements rises, and looking at just one obituary you may not see the cause of death, but when you look at the newspapers day to day they tell the story. The articles on the front pages announcing the death tolls in various cities, the public announcements about protecting yourself from contracting the disease, and the numerous obituaries that all say they died of "influenza", "pneumonia", or "a short illness". Even when I am able to get Lena's death certificate, I may not know for sure as its more common for the doctors to list pneumonia or some other complication that was caused by the flu as the cause of death. The possible doors that this obituary opens are numerous, it says she was born in Oswego, New York, who her parents where and where they were living, which church she went to, and who her siblings were and you can follow up on those leads to find the records that are needed for genealogical proof. But, when you look at the historical context of this obituary, when you begin to read for what it is not said directly, it is more than facts and helps tell the family story. 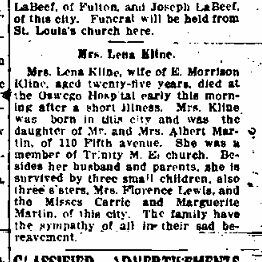 "Obituary of Mrs. Lena Kline," Oswego Daily Paladium, Oswego, New York, Monday, October 21, 1918, Obituaries, available online at www.fultonhistory.com, Accessed 05 May 2013.